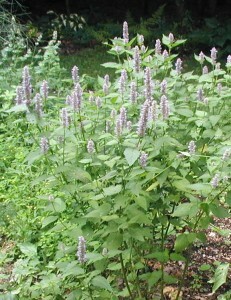 Blue Giant Hyssop, Agastache foeniculum, volunteered near the edge of the garden this year. It was planted near this spot a few years ago and we’ve enjoyed it ever since, where ever it springs up from the dropped seeds. We let it grow to 4 to 5 feet tall before pruning it back to about two feet tall in the first week of June. Use this herb by hanging the cut stems upside down to dry for a few days. Carefully strip the leaves from the stems so as not to bruise or break them. Once dry, place the leaves in a glass jar and use for tea. Lends an anise-like taste. Side branches grew to form a shrub that blossomed from the end of July through August. The long spikes of flowers were many and they gave pastel colors of light blue to faded violet to the garden. Blue Giant Hyssop flowers in the herb garden. The plant itself looks nice because insects don’t seem to enjoy eating the leaves very much. With the heart-shaped leaves intact the giant blue hyssop would make a nice addition to a native plant garden. 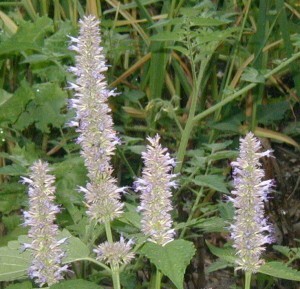 Terminal spikes of blue hyssop flowers. The leaves and flowers can be collected and dried for tea, potpourri or sachets.